When your company decides to migrate from IBM Domino to a new email system, or needs an archived or journaled version of your existing email databases, you need to be confident it will be accessible, readable and accurate. Because EML or MBOX are the standards-compliant format common to almost all email systems, there is a need to convert emails with a higher degree of fidelity than that offered by native IBM Domino technology. CoexLinks Migrate is the premier solution for high fidelity representation of email, whether it is to be stored on disk or streamed to another email system. Many emails are formatted carefully with the expectation that the recipients will see what has been created. Without a high fidelity conversion to EML/MBOX, your new email system or archival reposiory may return deceptive, incomplete, ill formed or unprofessional results. CoexLinks Migrate ensures your migrated emails are as professional and accurate as they were back in IBM Domino. A license for CoexLinks Migrate™ is required for each IBM Domino user mail database which will be migrated with the software. Full pricing and licensing information may be found on our CoexLinks Migrate pricing page. For an official quotes, please contact us by phone at +1 216-991-5220, or by e-mail at Sales@GeniiSoft.com. 1) Do I have to change the design of my applications to use CoexLinks Migrate? No. CoexLinks Migrate runs by command line or console command, and requires no changes to the databases to be migrated. 2) Is CoexLinks Migrate easy to install and configure? Yes. Installation is simply the addition of an executable file and a DLL (shared library on UNIX systems), as well as a license file in your Domino data directory. Configuration is even simpler, requiring at most the addition of a few lines in your NOTES.INI file. 3) Does CoexLinks Migrate use any unsupported calls that might cause trouble in future versions? 4) Is CoexLinks Migrate tied to a particular version or point release of Domino? 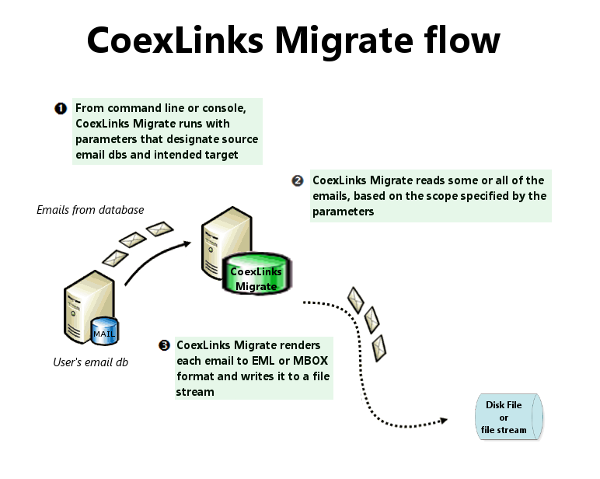 5) Does CoexLinks Migrate need to be installed on every server or client? No. The software only needs to be installed a server if it will be run on that server. 6) Do you have local support in [name that region]? 7) How do I know Genii Software will still be there next week or next year?